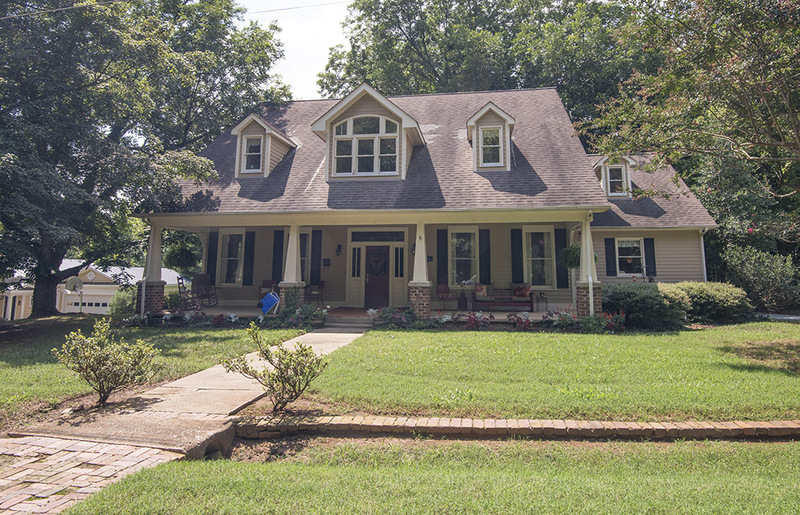 Constructed in the 1920s as a side-gabled, Craftsman-style bungalow, this house has been significantly altered with the re-design of the roof, the installation of additional windows on the façade, the reconstruction of a front-gabled dormer, and the construction of additional dormers. The one-and-a-half-story, side-gabled house is currently five bays wide and double-pile with a lower one-and-a-half-story, side-gabled wing on the right (north) elevation. The house has plain weatherboards and replacement windows, including a group of three windows with a wide arched transom in the center dormer and single windows in the three other dormers. The original four-light-over-three-panel door remains centered on the façade, flanked by two-light-over-two-panel sidelights and topped by a one-light transom. It is sheltered by a reconstructed, engaged, shed-roofed porch supported by tapered wood posts on brick piers. County tax records date the building to 1921 and the house was renovated and enlarged in 1995.